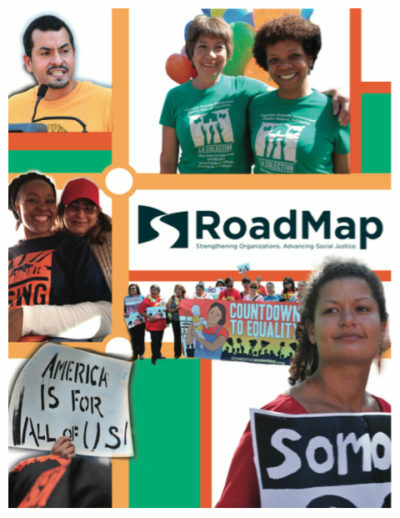 When I joined RoadMap as its first Strategic Communications Coordinator, I was excited to be part of a network of consultants home-grown from grassroots social justice groups. I was also excited to have the chance to bring communications down from its cosmic orbit to root it squarely in the terrain of institution-building where I believed – and still believe – it belongs. That was three years ago. Since then, there have been some exciting developments in strategic communications for the social justice sector, some interesting experiments and a clear and persistent need to strengthen the communications capacity of grassroots organizations and alliances. With nonprofit funding endangered and digital communications tools rapidly evolving – really, propagating like mutant bunnies – the need to root communications in healthy organizational structures and strategies is more pressing than ever. Why? Because it’s becoming harder to make multiple mediums and messages matter. It’s becoming harder to cut through the chatter to actually have sustained influence with the people you want to mobilize and sustained influence on the public debate at large. And it’s becoming more urgent to do so in this information age. It’s an age where the process of sharing ideas and symbols, of debating problems and solutions constitutes one of the most important ways to build influence and power over the decisions that affects our lives. That’s where integrated communications comes in. So what is integrated communications? Well, if you’re a marketing hack, then integrated comms is the oh-so-clever combination of promotion-oriented sub-specialties – including branding, advertising, social media, public relations, etc. – brought together to achieve marketing goals. If you’re a telecommunications executive, then integrated comms means you’re making an obscene amount of money off selling packages of telecom services including databasing, broadband, mobile, videoconferencing, satellite and VoIP technologies. Now, if you’re a social justice campaigner, integrated communications doesn’t mean much – yet. But RoadMap is out to change that. Integrated communications for social justice nonprofits is a developing approach designed to help groups build the in-house communications capacity that will allow them to influence for the long haul, not just spin for the short term. Integrated communications for social justice combines not only multiple methods of strategic communications – media monitoring, communications planning, reframing and narrative development, online and legacy communications, multimedia production, etc. – to help achieve organizational goals, but also weaves these communications methods together with other related work – like base-building, strategic planning, IT development, grassroots fundraising and more. Together, these two layers of integration constitute the type of in-house communications capacity that can allow grassroots organizations to cut through chatter and engage effectively and authentically in the public debate. This type of capacity is simply worth investing in. It can address some core problems that keep us running in the same place: sporadic communications that is too often reactive, technically instead of strategically oriented (toward production and output of social media posts, newsletters, etc. ), and isolated from key organizational decisions and developments. Also, we are getting more and more specialized in certain areas (social media, video production, storytelling, blogging), creating “islands of communication” that donʼt necessarily support a unified communications strategy and practice. This, of course, has something to do with resources, but it also has to do with how communications capacity is built. RoadMap’s unique combination of communications and OD specialists allows us to help you build a unified communications practice that works efficiently with the rest of your organization – all without having to grow a whole communications department out of imaginary resources. Just five years ago or so, our sector was still warming up to the idea that communications is core to achieving sustained impact. Now it’s a given. But how to make it a core organizational practice rather than mostly an outlet for social media interns, a burden dumped on organizer/manager/development people’s overfull plates, a never-ending series of trainings and webinars, or the specialized domain of pinch-hitting PR firms – this is what many groups struggle with, and this is exactly where RoadMap can help. RoadMap’s approach is grounded in this simple scenario: You wouldn’t hire an outside firm to implement campaign work or to execute biannual fundraising drives, and you wouldn’t go without these things either; so why should groups have to forsake communications work, or rely on outside firms to do their communications for them? The answer is, you don’t have to go to either of those extremes. And you don’t need the budget of a telecom firm to build your own communications capacity. RoadMap’s network of justice communications experts specializes in working with the strengths and the limitations of grassroots groups, to identify priority areas of communications improvements that build on existing strengths rather then trying to build communications capacity from nothing, or rather than delivering one-off services that leave little to no capacity behind. Take, for example, the case of the Missouri Rural Crisis Center (MRCC) in Columbia, Missouri. MRCC is a lean organization (2.5 FTE staff) that packs a mean organizing punch. RoadMap used the integrated communications approach to identify their strengths – their robust active base of more than 1,000 family farmers and local food advocates, their incisive strategic vision – and to integrate priority communications upgrades that would fit their lean capacity and help them grow their impact. RoadMap’s work with MRCC is an example of how our approach can help groups grow the relevant in-house capacity they need to achieve deeper, more meaningful and more sustained influence and impact. RoadMap worked with MRCC thanks to a capacity building grant from the Unitarian Universalist Veatch Program at Shelter Rock. Ask your funders if they would provide a similar grant. RoadMap also works directly with organizations, and will work with groups and funders to pool money to support integrated communications work. – Integrated implementation: A team of OD and communications consultants working with a team of communications, organizational decision-makers and possibly other relevant team members including development director or organizing director depending on the intervention. An important part of integrated communications is a constituent relationship management system (CRM) that makes it possible for you to keep track of participation – organizing, fundraising and advocacy – and carry out communications with your various constituents. You can get help evaluating a current CRM system, renovating it or identifying a vendor for build out of a new one as part of an extended integrated communications capacity-building engagement. For organizations that come to RoadMap with other priorities, like board development, grassroots fundraising, transition planning, etc., hiring a RoadMap OD consultant means you can also get communications support integrated into these contracts. For example, groups that approach RoadMap for strategic planning support can benefit from a team of RoadMap consultants working together to integrate communications assessment and planning benchmarks into the overall strategic planning process. This support with integrating communications planning can be done for all levels of organizational planning. RoadMap also currently offers specialized support in two areas: organizational and alliance communications capacity assessment, and opposition communications preparation and response. The communications assessment is a diagnosis of where your communications could be stronger, followed by analysis by a RoadMap consultant of how to start to tackle these areas in a realistic way. The opposition communications prep and response is part of RoadMap’s Weathering the Storms project. It can include a two-part webinar series that integrates primers and case studies on communications, legal and OD preparation and response as well as a set of simple opposition communications tools that can be introduced to you through training and/or a package of TA hours. These services are a great complement to the other services out there in the sector – to training, coaching, peer learning services, etc. They complement because they help an organization institutionalize individual skills and integrate communications practice and systems across an organization. And for those organizations that work with PR firms, RoadMap’s services can help capture some of the relationships and skills that PR firms leverage and can help bring those into your organization. We offer these services to alliances and networks as well as individual groups, and can also adapt our process to troubleshoot with coalitions. There’s no one path to stronger communications, but RoadMap does offer one clear way. So take advantage of us! RoadMap likes to be taken advantage of. And we welcome your thoughts on how integrated communications might help, or might already be working in your organization.